A PDF file does not necessarily have to contain all used fonts. If a font is used inside a PDF for a text, it is referenced by its name. The font can either be contained - then the contained font is usually used when the PDF is displayed, or cannot be contained - then the respective PDF viewer can search for a font with the referenced name on the system, and (if such a font is not found) use another font for displaying the text. As several PDF-based ISO standards require used fonts to be embedded, the Fixup "Embed missing fonts" is already present in various Profiles for converting files into a standard-compliant PDF. There are also predefined, single Fixups contained in the Libaries of the product. The Fixup "Embed missing fonts"
Besides the possiblity to set the "Scope" (complete document, page contents and/or comments and/or forms), it is also possible to embed the fonts as a "subset" (which means only necessary fonts will become embedded). By default, several system font folders will be search for fonts to embed. You may either add an additional search path or limit the search to this specific folder. Recursively it will search also in all sub-folders. As sometimes not all needed fonts are available or only in a variant of the name (e. g. "Arial" ./. "Arial MT"), a substitution of fonts can make sense. Sometimes it is also more important to ensure the content is maintained and smaller visual differences (caused by using a slightly different font face) are acceptable. 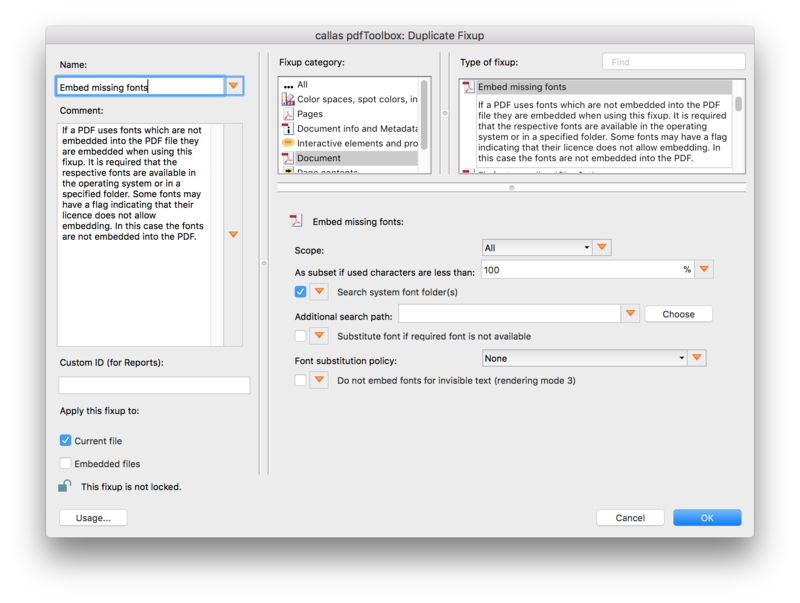 You'll find a detailed explanation how to set up a Font substitution policy file in the respective article. There is also the possibility to exclude invisible fonts (using the so called "rendering mode 3", usually used for OCR documents) from embedding. In addition, various wrapper formats are recognized, e. g. Mac resource' sfnt' files.